My younger son was “that” kid. When he was four, he would run around the circle at circle time, kick sand across the playground, and refuse to obey rules, whether he was at Gymboree, preschool, home, or out in the community. With each expulsion from an activity, his challenging behaviors got worse. What I didn’t realize at the time was that everyone, however well-intentioned, was treating the symptoms while ignoring the underlying problems. He wanted to behave; he just couldn’t. Educators and administrators, often trained in traditional behavior modification procedures, regularly try to control children’s behavior with rewards and punishments, instead of helping them learn the skills needed to control their own behavior. Data indicates that nearly 10% of preschoolers and one in seven K-12 students are suspended or expelled each year for non-compliant or problem behavior, many for minor offenses. Kids with learning and behavioral disabilities, such as ADHD and Oppositional Defiant Disorder are suspended at approximately twice the rate of their peers and incarcerated at practically three times the frequency of the overall youth population. Child psychologist and author Ross W. Greene maintains, “Kids do well when they can,” and when they can’t, it’s because they are delayed in the development of crucial cognitive skills. Challenging kids are not always challenging: they’re challenging only when the expectations placed on them outstrip their skills. It is in these situations that they communicate their difficulties through challenging behaviors, be it whining, withdrawing, screaming, swearing, hitting, spitting, lying, or stealing. In other words, challenging behavior is simply the means by which a child communicates that he is having difficulty meeting certain expectations. Greene stresses that challenging kids do not lack the motivation to do well, nor are they attention-seeking, manipulative, coercive or limit-testing. What challenging kids lack are the skills not to be challenging. 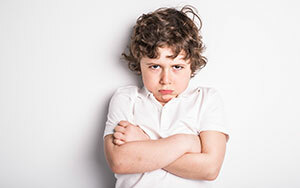 Consequently, if challenging behavior is caused by lagging skills and not by lagging motivation or manipulative behavior, it is easy to understand why rewarding and punishing a challenging kid may not make things better or help him learn essential skills for lasting success. Dr. Greene’s evidence-based approach, Collaborative & Proactive Solutions (CPS), is centered on solving the problems that cause the behavior, not merely on modifying the behavior. If you understand why and when your child is challenging, you can help him problem-solve in a collaborative and proactive way. Specifically, the way to reduce challenging episodes is by (1) identifying both the skills he is lacking (lagging skills) and the specific expectations he is having difficulty meeting (unsolved problems); and (2) collaboratively solving the problems underlying the misbehavior. If you try to solve the problems unilaterally, through imposition of adult will, you won’t solve anything permanently and will only increase the likelihood of challenging episodes. And because unsolved problems tend to be highly predictable, the problem solving should ideally be done proactively. What skills does the research tell us behaviorally challenging kids are lacking? Those related to executive functions and problem solving, language processing and communication, emotional regulation and frustration tolerance, and cognitive flexibility and adaptability. Executive function skills, for example, impact hindsight and forethought­—the brain’s ability to reflect on past experiences to help solve current problems and to project potential solutions into the future to determine the best way to proceed. When kids are lagging in these essential skills, it is easy to understand why they are likely to have unresolved problems. The CPS model not only promotes a problem-solving partnership, it engages kids in solving the problems that affect their lives, produces more effective and long-lasting solutions, and teaches skills along the way—skills such as empathy, appreciating how one’s behavior is affecting others, resolving disagreements without conflict, taking another’s perspective, and honesty. Dr. Greene’s compassionate approach has transformed the understanding of how to treat kids with social, emotional and behavioral challenges, those at greatest risk of falling into the special education-to-prison pipeline. Over the years, his method has dramatically reduced discipline problems and punishments for challenging kids and adolescents in countless families, schools, therapeutic facilities and the juvenile-justice system. Dr. Greene is the author or co-author of numerous books, including The Explosive Child, Lost at School, and most recently, Raising Human Beings. Eve Kessler, Esq., a criminal attorney with The Legal Aid Society, is the co-founder of SPED*NET, Special Education Network of Wilton (CT) and a Contributing Editor for Smart Kids with Learning Disabilities.